Milam’s Tree Service is proud to be Best Pick Reports Certified! 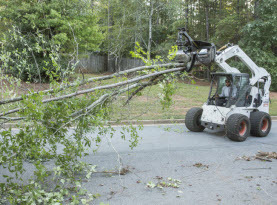 We Googled and found Milam's Tree Services online when our tree went down in the last storm. I called a couple of tree companies after hours but Milam's was the only tree company where a live person answered. I talked to Josh, one of their tree professionals and he was great! He offered to get someone out that night since my tree was blocking the driveway but it was ok until the morning. The crew was out first thing in the morning to take care of the storm damage clean up. Josh was there to see if we could save the tree but it was too damaged. They did the dangerous tree removal of the fallen tree quickly and safely. They did a full cleanup of the branches and brush and were very helpful. Josh evaluated my other trees and had the crew do some tree pruning and topping so I wouldn't have more fallen trees on my hands. I highly recommend them and plan on calling them again; this time for some landscape dirt, gravel and mulch and possibly for help in planting a new tree where the old one is now gone. Milam Tree Services is the best tree company in all of Jonesboro.. no scratch that, Clayton County! I run my firewood sales and gravel supplies through them and I've used their tree experts over the years for everything from tree pruning and trimming to tree removals with and without their crane services. Most recently, I called for an estimate on Thursday and the whole job was completed on Monday as promised. I had a large, old tree that had sustained so much storm damage over the years, I didn't think it could take the next one. The tree professionals from Milam did an outstanding job on the dangerous tree removal for a great price. They arrived on time, well equipped and ready to work. The tree was already leaning on my house and I was scared if it fell anymore, it would break through my roof. Milam did the stump grinding too which left me plenty of mulch. I would recommend them to anyone needing tree services. I had set up a date with a company out of Covington Georgia to cut and remove 3 large pines and grind up 60 stumps. 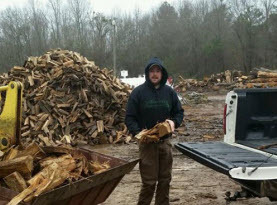 After calling and texting never got a response back, I then called Milam' tree service on a Saturday to get a estimate for the same job, Josh showed up about an hour later for the estimate. I agreed to the estimate also shocked by the lower rate charged compared to the company in Covington, Josh said it would be Thursday to do the job, they showed up two day's earlier. Couldn't even tell they were here, trees were gone no mess what so ever had 44 stumps ground up because I have plans of bring them back this winter to cut more trees and grind up the remaining stumps. Couldn't have asked for better service and highly recommend Milam's. I can't praise enough the professional and great job they did for me. 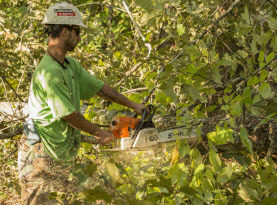 Milam's Tree Service were referred to us by our neighbor when we were looking for a tree company to do some tree topping and shaping for us, as some overgrown trees in our backyard were obstructing our views. 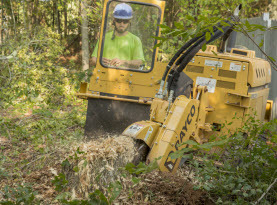 We were so impressed with their work and results that we have retained their services over the years for everything from stump grinding, stump removal, cabling and bracing and storm damage brush clean up to name a few. They always go above and beyond and are the only tree specialists we call! We had a very old tree that was starting to die out. Not wanting to wait until it fell down on its own, we called Milams Tree company for some tender loving tree care. After their thorough tree inspection, they unfortunately agreed that we needed an emergency tree removal (and we decided on a stump removal too) as we were expecting some big storms and were dreading all of the storm damage clean up that would be needed. Watching them work was indeed a work of art. They bought down the large tree whilst never once disturbing our fence, flower garden or any other area of our yard or driveway. Since then we have called them back out for some seasonal tree pruning and trimming and some tree cabling and bracing too. If you are looking for tree professionals that do it right the first time, call Milams! These guys are real professionals!! They arrived on time, performed the removal the five trees required, and thoroughly cleaned the site after the work was done. All in about an hour and a quarter. I highly recommend Milam tree Service. This company gave me a quote the day I asked for one. The price was more reasonable than I expected. They were delayed one day by weather, but within two days, they had my 4 trees down with no muss, no fuss. No money up front. Couldn't ask for better service. I called late on a Friday afternoon. Mr. Milam was at my house the next morning to give a quote - for me and my neighbor. A crew of four men arrived at 8:15AM Monday and spent the whole day in our yards; not leaving until the job was complete at 7:30PM. I had three trees removed and major pruning of remaining trees. My neighbor had three trees removed, also. Milam's work is very professional and their clean-up is immaculate. Their objective is to please the customer, and I am a happy customer. Thanks Milam's for a job well done! Courteous, efficient, affordable, quick! Came out when promised, removed the huge tree, cleaned everything up and it looks better now than it did. I am so pleased with this company. I took a chance and used a new tree service this time and I am glad I did. Milam's will be my tree service from now on and believe me with all the old trees I have they will definitely hear from me again. No need to look any further if you need a tree service! Thank you!!!! Prompt response, thorough and efficient work, courteous crew.....I am truly impressed with the services provided by this company. They removed three large trees from a very tight space in the corner of my home which presented no problems for this group of professionals. I strongly recommend them for all of your tree removal needs. These guys were very professional. A representative arrived when he said he would to provide an estimate. He was very professional and friendly. My protection dog met him and immediately approved of him. That's a good sign. His price was very fair of three estimates I got for the removal of three trees due to storm damage. I elected to use this company based on the fairness of price, my dog's reaction to the rep and my gut feeling. The work crew arrived and were equally professional and courteous. The crew went above and beyond the agreed upon work. They cheerfully cut up some of the wood into firewood for me and stacked it out of the way of the rest of the yard. They cleaned up exceptionally well. Instead of risking destroying a portion of my privacy fence because they weren't sure where a huge tree root would end up after they cut off the top, they dismantled the section of fence. Very thoughtful of them!!! They ground the stumps up so thoroughly I can't believe huge oak trees once stood there! They even kindly asked if I wanted to keep the mulch! I'm career military. I call it like it is. These guys are true professionals. Ladies, if you live alone, don't fear calling these guys up for an estimate and to perform your work. They are honest and cordial. Even though I'm a man, I truly feel they won't take advantage of you to make a fast buck. They removed several trees, limbed up several more and ground all of the stumps. These guys are amazing and I cannot say enough good things about them. They were prompt and showed up when promised. They met a slightly less expensive estimate I had received from another company. They were professional and courteous, and that included everyone from their office staff to the guys who came out and cut my trees and ground my stumps. They also followed up after the job was done with a phone call to make sure I was satisfied with the service I received and then sent a card thanking me for my business. In a world where it is sometimes hard to trust people, these guys were a great find and I HIGHLY recommend them. I would use no one else for any future tree needs. They also deliver mulch, fill dirt and top soil and they are very reasonable. Removed a storm damaged tree and trimmed some very high branches on a large oak tree. I have used them before. Actually fun to watch as one of their crew is a serious athlete with his ability to run up the side of a tall tree. They have been on time with good cleanup. They bring the appropriate equipment and a large crew even though it was a small job this last time. Got a quote today, and the crew was here same day taking trees down, including cutting, stump grinding, shredding and clean up. Pricing was very good compared to other quotes. Professional, friendly crew. Very efficient, well priced and done quickly. Will be calling them again when I'm ready to take some more trees down. Milam's Tree Service removed two trees on my property in McDonough recently; cleanly and efficiently and at a very affordable price. The recent storm damage took its toll and emergency tree removal looked like the one option available to me. I only moved here a few months ago from Newnan but everyone I asked recommended Milam's Tree company for the job. The tree technicians even left my yard cleaner than they found it! As I was keeping the wood, the guys went out of their way to cut it up just like I wanted which I really appreciated. Josh, the owner came out for the tree estimate and inspection the day after I called and was able to do the work later that day. Great work from a fantastic tree crew. I will surely be using and recommending them in the future for all of my tree and stump grinding needs. Their lot isn't far away so I might even stop by to check out their operation and organic mulch for sale. If every company I hire in Henry County is as upright, friendly and honest as this one, I'll be really glad I moved here! I would like to bring it to your attention of the exceptional service we received from your employees in tree removal yesterday. Richi was very prompt in coming out to give me an estimate and setting up appointment for tree removal. Johnny and his crew arrived yesterday and worked diligently to complete the job to perfection. I will continue to call Milam Tree service when needed and will recommend you to friends/neighbors. Thanks to your crew for a job well done!!!!! I would like to commend Michael and his crew for a job well done earlier this week. They removed several very tall (100' or so ) pines that were situated among numerous other smaller mixed trees. With surgical precision, they managed to take down the trees, piece by piece, with virtually no damage to the other trees. The crew worked together like a well-oiled clock, everybody had their job and knew what to do and when to do it. It was a pleasure to watch them work. I don't know what these guys earn, but they deserve a raise, especially the brave soul that was hoisted to the tops of those trees with a chain saw to do the cutting. Thanks. I just have to say THANK YOU !!! My tree is gone, my Mom is no longer sitting upstairs crying, worried about it falling and hitting the house and I am so grateful. These guys have always done a perfect job for us. The yard is clean and you can’t even tell they were here, except for that worrisome tree is gone. After the hurricane season, I will be calling again to get some tiny dogwoods cut down and some tree limbs cut so my Mom can see the golf course lake from her sunroom upstairs. Thank you for making the time for us and for always being there for us over the years. It was nice to see the guys again ! !